Collecting and preserving vinyl records is just like decorating your house. You have to take care of more than just your records. Anyhow, there must be a reason behind such an enthusiasm. You’ve probably heard of the pronounce resurgence in vinyl albums. The most attention grabbing feature of vinyl record has been the medium itself. How people love to place the needle on top of the records and how mesmerizing is the artwork. The reason can be anything, but there are things that are more important to continue collecting and keeping vinyl records. So, all you need is go through this post and keep every information in your mind. The rest depends upon your interest and love for these valuable pieces. To begin with, you need to know the kinds of vinyl records available in the market. Firstly, vinyl records differ in terms of size, speed and weight. Vinyl records have been manufactured with three different weights. Most released records carry 180 grams weight. They are quite thick which is great. The thickness makes them stay longer and wear less with time. Then there are finer and lightweight records having 120 – 160 g weight. 7-inch singles: they are the smallest in size, having extensions of albums. They offer 45 rpm speed. 10-inch singles: these records offer 45 rpm speed. Old 10-inch singles used to run at 78 rpms but they’re mostly unavailable. Vinyl records should be kept in a place where there is no dust or dirt. While they’re secured inside the sleeves, the can catch dirt through the small whole or openings. Make sure they are positioned vertically. Horizontal placement of vinyl may result in warped records. No need to mention the mechanics of turntable here, but the things that makes it impressive should be well-maintained. Apart from the platter, you need to take care of the components like the motor, the tone arm, the needle and the magnetic cartridge. Needle and cartridge are replaceable and you can upgrade these components for better sound quality. Normally diamond stylus and carbon cartridges offer the best results, but you also need to consider the quality of stylus as well as the number of coils in the cartridge used. Modern turntables come in two types; direct-drive and belt-drive. They are different in terms of operation and motor placement. In direct-drive turntables the motor is beneath the platter and it spins the record, while belt-driven turntable has a motor placed separately rotating the platter by means of the belt. Belt-driven turntable is more suitable for living room environment because it offers less vibration, while direct-drive turntables are mostly used by DJs and professionals. They allow manual controlling and they’re more expensive than belt-driven turntables. To explore the abilities of your turntable, you need a high-quality pre-amp. As you’re starting vinyl collection, you need to make sure nothing goes wrong. So, do you research on pre-amp models out there! Your turntable produces sound that needs further processing before you can listen to it. It needs to be amplified to become audible. There are some cheap models with built-in pre-amps, but don’t expect them to do justice with the original sound stored in vinyl records. You need to invest in a good phono pre-amp to produce crystal clear and natural sound. Now there must be a sound producing device for high-quality music. You can connect your turntable with home stereo speakers. Some multi-purpose record players do feature turntables with speakers, but they have limitations in terms of sound quality. You can only get the best sound if turntable and speakers are separate from each other. With the setup almost complete, you need something to preserve these albums. What about saving the music in MP3 format? Yes! You can do it if you buy a turntable with USB connectivity. USB connectivity is one of the most advanced features allowing simple and quick connectivity and conversion. If you your turntable doesn’t have USB port, you need to connect it to your computer by means of receiver. Furthermore, there’s a conversion software to transfer Vinyl albums to your PC or CD’s into MP3 files. Audacity has been the most popular conversion software available for free. Turntables with USB connectivity also contain this software for simple and quick conversion. Well, you’re almost done! Just few maintenance items for your vinyl as well as record player are left. Starting with fiber brush, it is a device that is used to remove dust and debris off the grooves of vinyl records. You need to use this brush a couple before and after playing music. Why? The reason is, as the record spins, it generates vibrations and magnetic field that attracts dust and debris from the surrounding. The dust stays on the surface which may penetrate inside the grooves and damage the quality of sound. Carbon fiber brush ensures that your vinyl record remains clean all the time. Even after cleaning with carbon fiber brush, you experience a problem in sound quality (skips and clutches), you need to clean it using a cleaning kit. Skips and slips are caused by the stubborn dust particles stuck inside the groves of the record. They need proper cleaning. So, you need a proper cleaning kit for that. 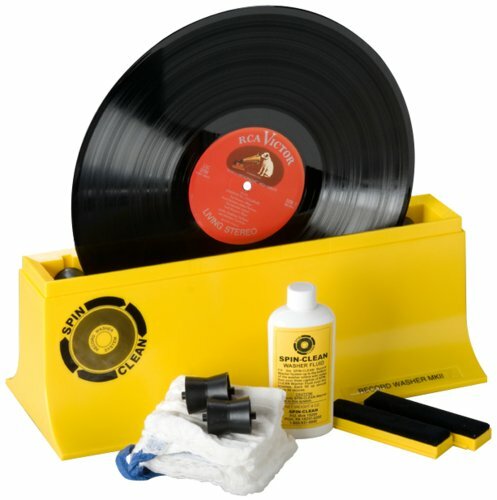 Record cleaning kits are available in all music stores where vinyl is sold. If you want to create a great collection of vinyl records, you need to take care of these things in particular. A good music comes with a price and effort, and with all the above mentioned things properly taken care of, there’s nothing to stop you from enjoying high-quality sound.